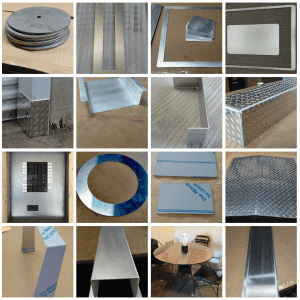 Sheet Metal used in these pics are Stainless Steel, Aluminum, Aluminum Diamond Plate and Carbon (mild) Steel. 3 projects the customer send us a drawing, mostly a hand drawing showing all the necessary measurements. Based on the drawing we generated a free quote which the customer then was able to order online through our online order process for quotes. 4 easy steps to configure your sheet metal part you really need.